On 30th of June, Krishnan and I visited the Dindigul and Chinnalapatti weaving clusters. The Dindigul weaving cluster weaves exquisite cottons and organic cottons. With Co-optex backing them and Mr. Venkatesh Narasimhan, MD Cooptex thinking up of innovative designs, the weavers of the Dindigul cluster are weaving magic !! I had bought one of their creations when we visited Co-optex Egmore in June and I bought one here too. 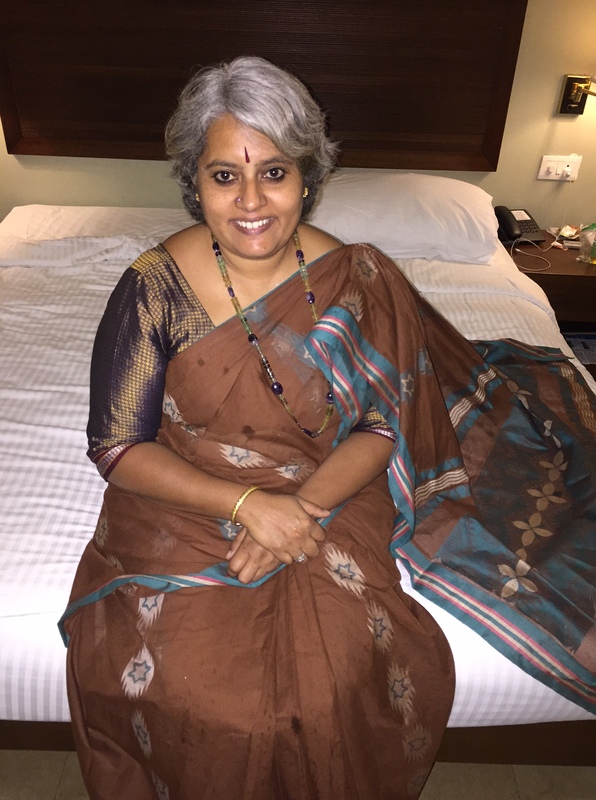 The checked blue sari is non-Co-optex. 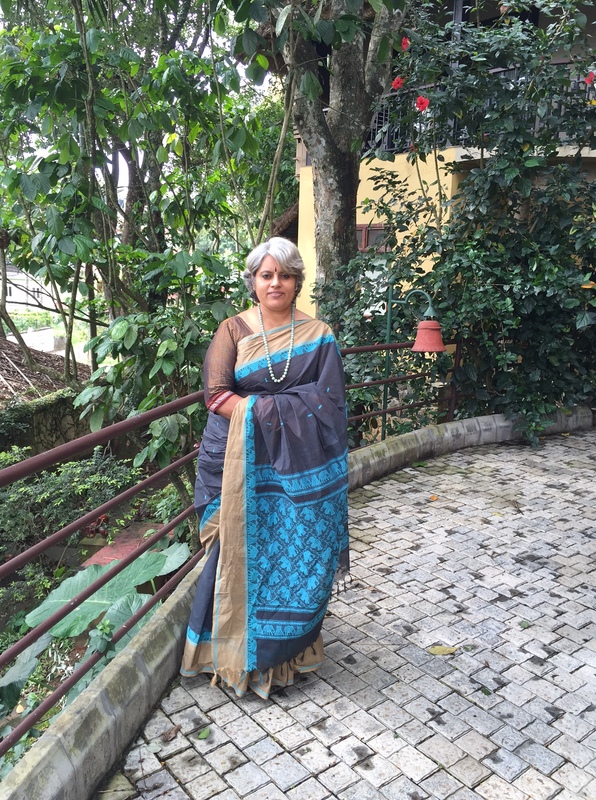 I bought this sari at Vijayalakshmi silks, Bangalore. Infact, Krishnan pulled this out of a rack because he loved the checks. This is a silk cotton material with satin borders. Love the interplay of colours on this one. I wore this first on my birthday last year (2015). The neckpiece that I am wearing is an Adorjo creation. I had these strands of crystals and Nisha just strung them into this beautiful piece. The next sari is what I bought at Dindigul. 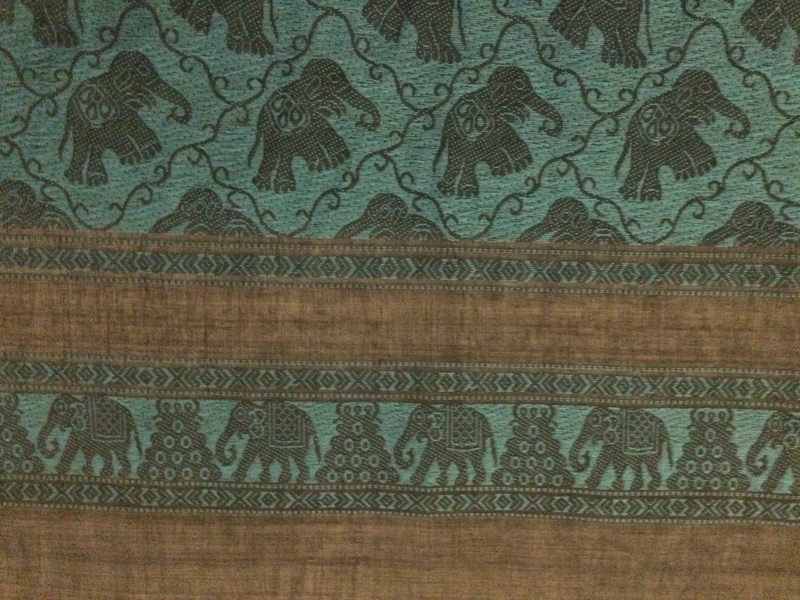 Its a bluish grey and the pallu and borders have elephant and “yazhi” motifs running over them. Just fell in love with the Pallu and yes the lovely colour. No pico or falls done for this sari yet, but am very proud of my running stitch that I did on the inside border :):). The neckpiece is from Desh Maheshwari, Noida. 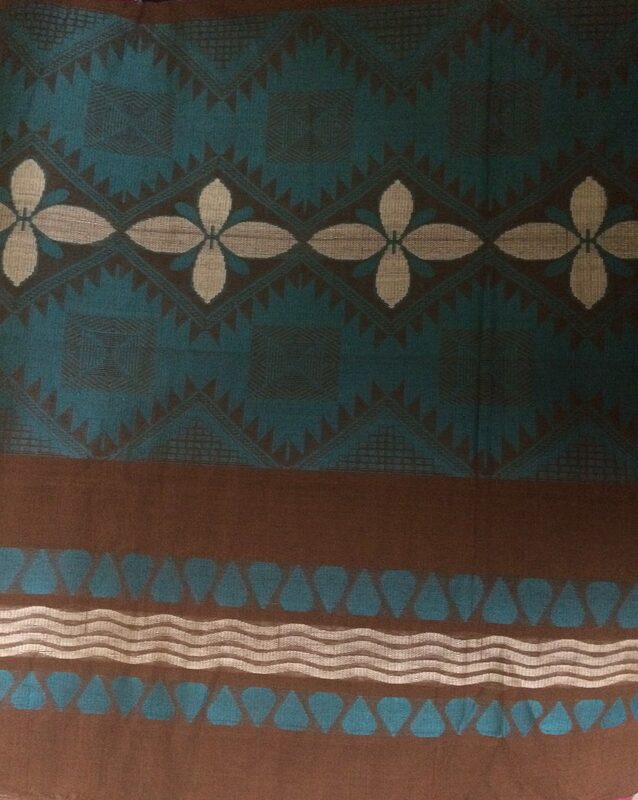 Here’s a closeup of the pallu and who will believe that this is handwoven, it looks like a painting. If it doesn’t look like a painting its because of bad photography by me, not the quality of weaving. The next sari has beautiful flowers in blue and who would have thought of chocolate brown and blue flowers !! This is from Co-optex, Egmore. 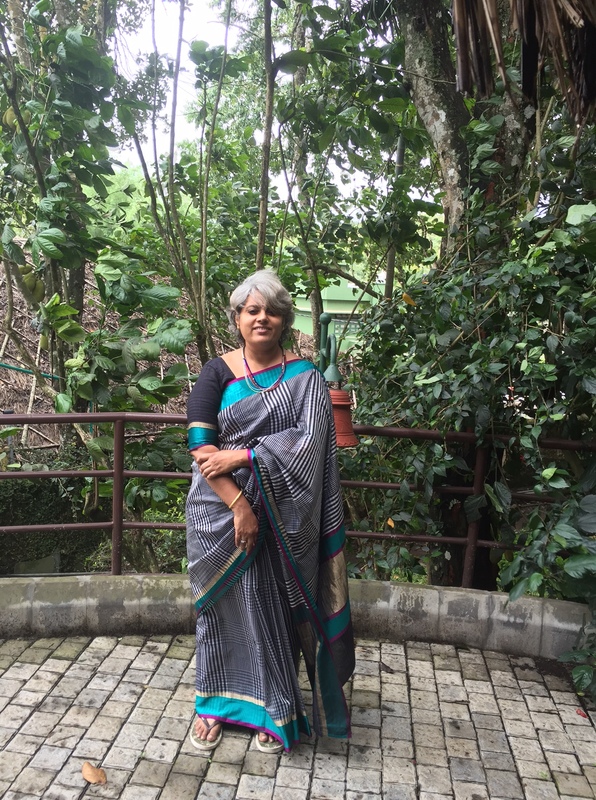 Please forgive my not-so-perfect attempt at posing with the pallu spread out… I am trying this after seeing the ladies on W3 posing so beautifully and in ways that shows off the sari well. But am learning, and will get there :). The neckpiece is again from Desh Maheshwari and I paired it with the same Khunn blouse that I used with the bluish grey cotton. 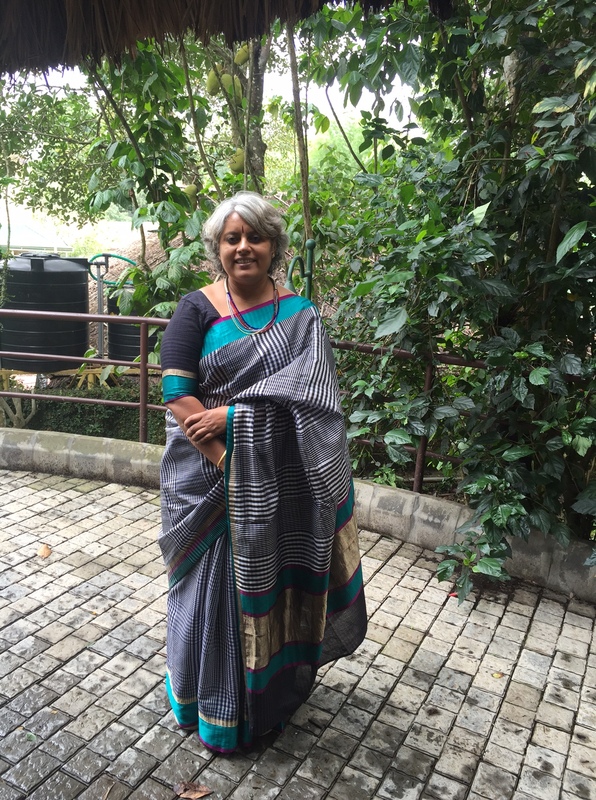 Here’s a picture of the pallu of this sari too and isn’t it just like a painting ?? Cant get over the gold colour flowers … beautiful. U are looking lovely in the beautiful sarees Bindu.